The supersonic P-800 Yakhont (Gem) is a ramjet version of P-80 Zubr [SS-N-7 Starbright]. The ship, submarine and coastal-launched Yakhont is launched from the unified ampoule-shaped transport-launching container (TLC). The container is 9 m long, is 0.71 m in diameter. The firing range reaches 300 km (162 nmi.) when flying along a combined trajectory and 120 kg (265 lb.) when following only a low-altitude trajectory. Flight speed varying over the range from M=2.0 to M=2.5 is provided by the kerosene-fueled multi-mode liquid-fuel ramjet. The P-800 Bolid is the encapsulated, submarine launched version of Yakhont. An air-launched version of the missile with the take-off weight of 2,500 kg (5,507 lb.) is also being developed. The closest American counterparts, the Tomahawk and Harpoon missiles, are subsonic; the best French antiship missile, the Exocet, has a range of only 45 miles. I was under the impression that Onyx was the Russian model of the weapon and that the Yakhont was the downgraded model for export as required by the Missile Technology Control Regime which limits the export of missiles with a payload of 500kgs or more or a range of more than 300km. There is no reason why the Onyx should be limited to 300km range or restricted in warhead size. It is the same with the Iskander-E which is an exportable weapon, while the Russian Army actually use a weapon called Tender-M which has a different heavier payload and longer range according to some sources. Im wondering if Russia intends to replace Granit with 300km Yakhont/Onix or what? Increasing the range of Oniks shouldn't be too hard, I would expect increasing its speed might also be a goal. For a while without a space based system operational having 300km range missiles instead of 700km range weapons is not actually much of a handicap simply because detecting carrier groups at 700km would be rather problematic for a vessel carrying these weapons. Should also point out that Yakhont is the export version of the Onyx... the Yakhont is limited by international treaties to have a range limit of 300km, but Onyx has no such limits and is probably longer ranged and with a heavier warhead. The land based ballistic missile that replaces the Scud in the Russian inventory is the Iskander-M, though it is sometimes called Tender. The Russian missile is reported to have a range of about 480 kms while the export model has a range limited at 280km because of range restrictions on exported weapons. Regarding the movable nosecone on Yakhont, most jet engines burn fuel subsonically and will choke on supersonic airflow so most supersonic aircraft with a jet engine will have adjustable intakes to change the airflow so the air enters the engine subsonically. A moveable nosecone on the Yakhont would be used the same way the radar is moved on a Mig-21 to control airflow to the engine at different air speeds. Of course the Yakhont is a ramjet powered missile so air goes in the front and is compressed by the tube getting narrow, fuel is added and burnt and it exits faster than it went in generating thrust. A ramjet still needs subsonic airflow to operate. A Scramjet, or supersonic combustion ramjet can burn fuel at supersonic speeds and ironically needs an adjustable intake even more to control the airflow so that the supersonic air and fuel mix properly and are ignited properly to generate thrust. The key here is speed. If you have 10 seconds to find and engage a target this is different to having 1 minute to engage a target. The difference height makes is detection distance and it is also a test of your radar and other detection equipment so close to a large moving surface. Phalanx for example suffered terribly from wave clutter and a target moving 3m above the wave tops might get through no matter how fast it is moving. With a supersonic target like Brahmos however Phalanx has a different problem because travelling at over 800m/s means that the effective range of the Phalanx of 1.6km means a 2 second burst is all you are going to get. At 4,500rpm which is the high fire rate that means 150 shots at the target smaller than the size of a desktop with no wings as such. This means you have to hit to kill... detonate the warhead because its speed is keeping it airborne and not some wings that could be blown off to make it plunge into the water. Even worse than that because of the speed of the incoming missile there is no point in firing at it within about 400m because your lead of the target will mean when it is 400m away you are firing rounds into your own ship. Add to that it takes the gun half a second to wind up to full fire rate and we are looking at less than 100 shots at the missile before impact and that simply isn't good enough to ensure a kill let alone make a kill likely. The USN agrees with this and has replaced the Phalanx with Sea Ram. A subsonic missile on the other hand spends a lot longer time in the kill zone and if it is alone should be effectively engaged by the defences of the target unless the target is unaware it is under attack. At the end of the day surprise is what you want, but the Yakhont was designed for use against US carrier groups so the assumption was that surprise was not possible so speed was used to compensate. BTW the figures given in the first post for Yakhont seem to be very similar to the figures for the Moskit or SS-N-22, except the Moskit weighs 4.5 ton in its air launched version. The Moskit was deemed able to defeat the AEGIS class cruiser of the 1980s (by flying at below 7m so Standard SM-2 couldn't intercept it, and at mach 2.5 so Phalanx was not much use either). Yakhont and Brahmos have similar performance but are 2 tons lighter! That is impressive. I would also expect their electronics are smarter too. Brahmos isn't perfect but it was designed for a specific role which it does better than all other non-Russian/Soviet missiles. What Garry said. The Klub is a far more superior and entertaining missile than the Onyx. Anywho, I give the Sea Ram, Sea Sparrow, and ESSM a good chance of intercepting the first 1 or 2 Onyx/Klubs. However, after doing the some radar horizon formulas, the maximum detection range of a 5 meter skimming Klub(3 meters will put it danger close to ocean waves, converting it into a Shkval) against an AN/SPY-1 mounted 16 meters equals to about 25.7 km. Traveling at 986 meters per second(M. 2.9), that would make the time from detection to impact out to 26 seconds. Against a Phalanx, penetration of the ship's defensive systems are almost guaranteed. Against Sea Ram, Sea Sparrow, and ESSM, again, good chance that the first 2 Klubs will get hit. Against the Steregushchy class of corvettes(2 are commissioned, each can carry 6 Klubs), that would mean a saturation fire of 12 Klubs, with minimal losses to them due to AEGIS. Assuming they're fired against a Nimitz class, assume 4 are intercepted, 8 Klubs = 1.6 tonnes of explosives detonating within the Nimitz. From Kinetic energy alone, each would generate about 20 kg of TNT equivalent upon impact, and depending on where they hit, I give it a fair probability of sinking said carrier. The Brahmos seems to be getting better , we now have a Block 3 variant which can be used in mountain warfare. Groshkov Class ships will be armed with Brahmos. DRDO Statement: The BRAHMOS Block III+ version was successfully test fired this morning at 1055 hours from a test range in Orissa. This landmark test once again established the mountain warfare capability of the supersonic cruise missile with new guidance scheme incorporating large scale manoeuvre and steep dive with precision strike capability. A naval ship placed with telemetry stations confirmed the accuracy of the mission and marked it as a text book launch. In this launch campaign the missile was put though extreme conditions and it successfully went through all complicated manoeuvres as envisaged in the battlefield in mountain terrains following the exact flight path given to it, said Dr. A. Sivathanu Pillai, CEO & Managing Director of BrahMos Aerospace. Gorshkov will be armed with Yakhont. Vladimir79 wrote: Gorshkov will be armed with Yakhont. No the russians have explicitly mentioned that Groshkov will be the first ship to have Brahmos ,its a joint development where both India and Russia will adopt it. First of all Yakhont is the downgraded export model of the Onyx, but the Onyx is not for export and is technically secret so they will call it by its export name, Yakhont. Second the Brahmos is based on the Yakhont but the modifications made to Yakhont to create Brahmos could very easily be applied to the Onyx which is a longer ranged missile with a larger warhead. Third I think the Russians might apply the improvements of the Brahmos to the Onyx and simply publicly call it Brahmos because the Brahmos upgrade was a significant upgrade over Yakhont. 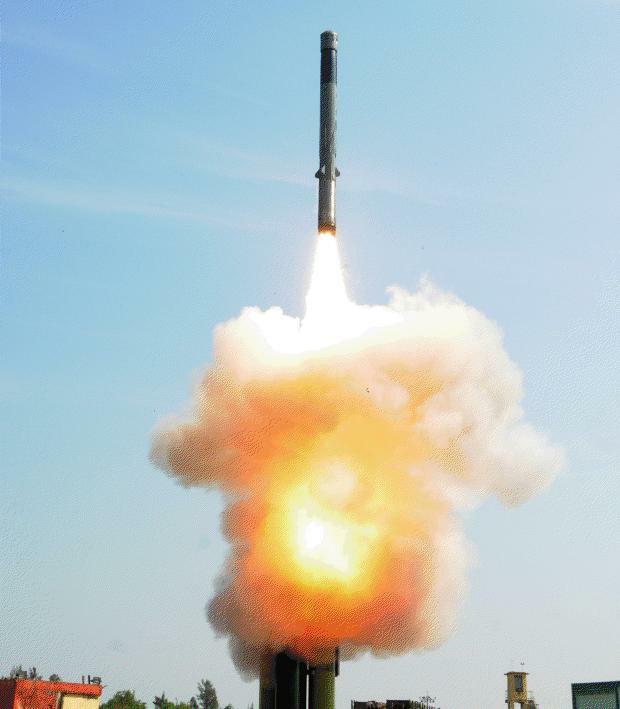 Brahmos block 3 ---> Land Attack with improvement in sensors to attack targets in mountainous terrain. While BrahMos Block-I version is an anti-ship missile, Block-II is an Army version meant for attacking targets on land. The latest Block-III is meant for operations in mountain warfare where the missile has to hit the target with a steep dive, Dr. Pillai said. has to hit the target with a steep dive, Dr. Pillai said. So the Russians would really only use the Block I model as the Russian Army seems happy with Iskander/Tender-M. The Su-30MKI is Indias plane. AFAIK the Yakhont/Onyx has already been tested on the Su-34... I have seen a video of a launch. I would expect they also have or are testing Yakhont/Onyx on the Su-35 as well... but who should pay for it to be integrated to the Su-30MKI? The Su-30MKI is Indias plane. BTW the USUK vertical launcher fitted to the Gorshkov should be compatible with Brahmos, Onyx, and Yakhont, because they are all very similar. This will also make Russian exported naval vessels more attractive because if India doesn't approve of export of Brahmos they can have Yakhont, while Russia can choose Onyx (for range) or Brahmos (for flexibility). ^^^ Yes I agree , Brahmos is a 49:51 JV between NPO Mash and DRDO , so cant expect NPO to alone foot the bill , its Brahmos Corp who should. For MKI reconversion the IAF should foot the bill since IAF will use it. One question, can P-800 be used as a surface attack cruise missile or just as an anti-ship cruise missile? The glonass guidance means it can attack land and sea targets. Its long relatively slim design means it can be fitted into the USUK universal vertical naval launch system... a very neat idea. Well, of course it depends on the size of the ship, but generally speaking, most ships that a Yakhont might face will probably take 2-3 Yakhonts before sinking. The problem is not about Cost it's about Ammunition capacity. IIRC, the something Corvette or Frigate only carries about 8 Yakhonts, and despite only costing about $12m for the missiles only, you still have to think about two things, getting the ship in range without getting shot at and not wasting your entire magazine for one ship. A shore based battery like the Bastion-P would be a very effective way of keeping enemy ships at bay, and deterring naval landings over 600kms of your territory. In combination with Bal-E it would be a fairly efficient defence for many countries. One Bal-E battery carries 64 missiles with up to 32 missiles ready to fire at any one time. Regarding costs the real equation is that there are very few navies on the planet today that could ignore such a capable system and for many navies it would be too dangerous to even try. For Indonesia it means that navies like the Japanese navy and the Chinese navy will have to think twice before they mess with them now that they have Yakhont in service... and they can use existing vessels... they don't need to spend trillions of dollars on carriers and support vessels to be a respected threat. A contract on the supply of advanced Russian anti-ship missiles to Syria is being implemented, head of the Federal Service for Military-Technical Cooperation Mikhail Dmitriyev said on Wednesday. Russia has repeatedly said it would honor a 2007 contract on the delivery of several Bastion anti-ship missile systems armed with SS-N-26 Yakhont supersonic cruise missiles to Syria, despite efforts by Israel and the United States to stop the deal. “This contract is under implementation,” Dmitriyev told reporters in Moscow but declined to elaborate. The Yakhont missile has a range of 300 kilometers, the capacity to carry a 200-kilogram warhead and the unique ability of being able to cruise several meters above the water surface, making it difficult to detect and intercept. Dmitriyev also said Russia will meet its goal to export $11.7 billion worth of weaponry in 2011. Russian arms exports topped $10 billion last year.